Place veggie kit in slow cooker and turn heat to high. Season with salt and pepper, to taste. Heat oil in large sauté pan over medium high heat until it shimmers, about 5 minutes. If oil begins to smoke, remove from heat to cool down slightly. Season chicken thighs with salt and pepper, to taste. Add chicken to pan and sear until they are a golden brown on all sides, about 5-6 minutes per side. Transfer the chicken and any juices to slow cooker on top of veggies. Pour jar of simmering sauce and 1 c water or chicken stock over the chicken and vegetables. 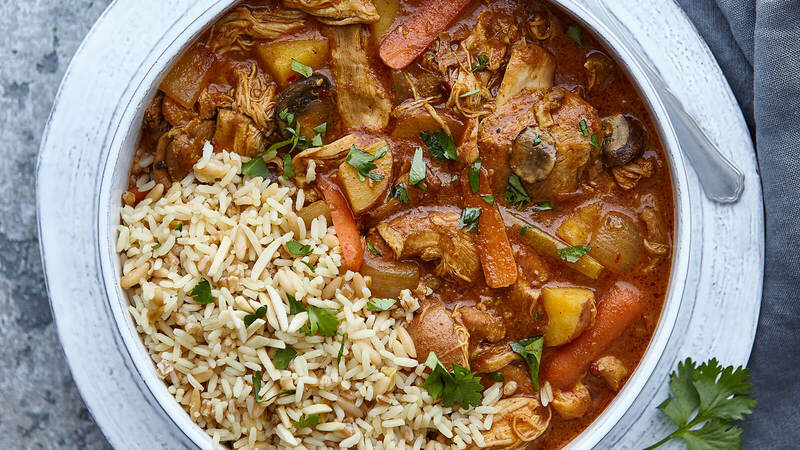 Cover and cook on low 3-4 hours or high for 1 ½-2 ½ hours, or until chicken pulls apart easily and vegetables are fork tender. Meanwhile, cook rice pilaf to package instructions. To serve, discard bay leaf. Spoon chicken and veggie mixture over prepared rice pilaf. Garnish with cilantro, if desired.